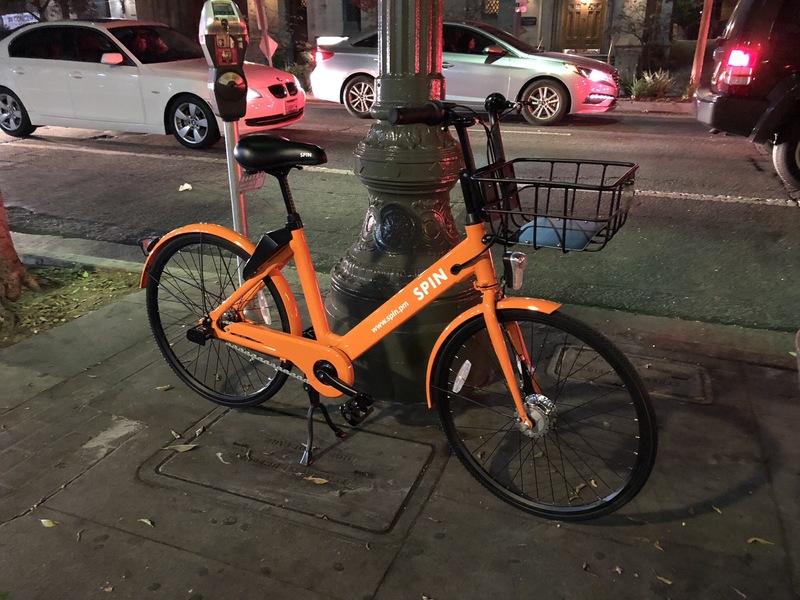 I noticed something curious this week at the Wilshire/Vermont subway station—a bright orange bike that wasn’t locked. Normally, an unlocked bicycle in Los Angeles would take a moment for a thief to ride away with it. But this was no ordinary bike. That orange bicycle is one of a few dozen of Spin Bikeshare, a dockless bikeshare service. Riders can use the Spin app to scan a QR code to unlock a bike. When the ride is over, the bike doesn’t need to be returned to a designated bikeshare dock. The rider only has to find a responsible place to park and locks the back wheel of the bike. How does Spin Bikeshare compare to Metro Bikeshare? The primary difference between the two bikesharing services is how and where they can be locked. Metro Bikes must be picked up and dropped off at a designated dock. Spin Bikes can be obtained wherever they can be found and don’t need to be returned to a specific location (Spin Bikes, oh where were you when I was in Philadelphia!?). The cost of a ride on a Spin Bike is quite appealing, at only $1 for a half hour. The price of a half hour ride on a Metro Bike is a less impressive $3.50. I’m curious to see how the dockless service will thrive in Koreatown. It’s a neighborhood that’s no stranger to cluttered sidewalks. Will Spin Bike riders practice good citizenship and park the bikes in places that don’t clutter the walkways? And will the low price tag remain? Here’s hoping the price stays low as Spin Bikeshare continues to expand. With that said, Koreatown is an ideal neighborhood for a bikeshare service, dockless or otherwise. The walkability rate is high and traffic is some of the worst in Los Angeles. There is no better way to quickly get around the neighborhood than by bike. Having a service available will encourage residents to give cycling a try, and hopefully encourage an expansion of bicycling infrastructure in the neighborhood.